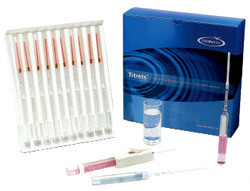 Chemetrics Titrets QAC LR kit. QACs are known for their bactericidal and disinfecting qualities. They are used extensively throughout the healthcare and food processing industries to sanitize, deodorize, and disinfect surfaces and equipment. QACs are also routinely formulated with various water treatments to inhibit algal growth in cooling towers, humidifiers, and swimming pools. These tests are applicable to the monitoring of QACs in cleaning solutions and cooling waters. CHEMetrics employs a titrimetric chemistry in which stabilized polyvinyl sulfate is the titrant and toluidene blue is the end point indicator. A color change from purple to navy signals the end of the titration. Results are expressed as ppm (mg/L) QAC. Kit comes in a cardboard box and contains everything needed to perform 30 tests: thirty ampoules with valve assemblies, titrettor, 25 mL sample cup, instructions, and MSDS.